So is the world ending or not?? watching discovery channel a few months back they reckon there is to be a major tsunami on the way and it will completley cover most of southern europe and reach the american coast covering the entire new york state. There is a volcano on one of the canary islands(i think) and they think it will eurpt causing the entire west side of the island to break off and hit the water at such speed it will cause one of the biggest ever tsunamis that will travel at 500kms an hour...is this the end for us . thats correct.half the volcano will slide into the atlantic creating it.it will happen but we can,t tell when.gettin back to the thread,any comments on whats been happening with our sun and a possible severe cold occurance. Posting this so people don't think the doomsday is coming after that mail online post. Reconnection is the trigger for solar flares of various sizes. As previously reported, solar flares from “nanoflares” to “X-class flares” are very energetic events. Granted, the largest flares my generate enough energy for 100 billion atomic explosions, but don’t let this huge figure concern you. For a start, this flare occurs in the low corona, right near the solar surface. That’s nearly 100 million miles away (1AU). The Earth is nowhere close to the blast. The biggest problem with an X-ray flare is that we get little warning when it is going to happen as X-rays travel at the speed of light (one of the record breaking 2003 solar flares is pictured. X-rays from an X-class flare will reach the Earth in around eight minutes. As X-rays hit our atmosphere, they are absorbed in the outermost layer called the ionosphere. As you can guess from the name, this is a highly charged, reactive environment, full of ions (atomic nuclei, and free electrons). During powerful solar events such as flares, rates of ionization between X-rays and atmospheric gases increase in the D and E region layers of the ionosphere. There is a sudden surge in electron production in these layers. These electrons can cause interference to the passage of radio waves through the atmosphere, absorbing short wave radio signals (in the high frequency range), possibly blocking global communications. These events are known as “Sudden Ionospheric Disturbances” (or SIDs) and they become commonplace during periods of high solar activity. Interestingly, the increase in electron density during a SID boosts the propagation of Very Low Frequency (VLF) radio, a phenomenon scientists use to measure the intensity of X-rays coming from the Sun. This is where much effort is being put into space weather prediction. We have a handful of spacecraft sitting between the Earth and the Sun at the Earth-Sun Lagrangian (L1) point with sensors on board to measure the energy and intensity of the solar wind. Should a CME pass through their location, energetic particles and the interplanetary magnetic field (IMF) can be measured directly. One mission called the Advanced Composition Explorer (ACE) sits in the L1 point and provides scientists with up to an hour notice on the approach of a CME. ACE teams up with the Solar and Heliospheric Observatory (SOHO) and the Solar TErrestrial RElations Observatory (STEREO), so CMEs can be tracked from the lower corona into interplanetary space, through the L1 point toward Earth. These solar missions are actively working together to provide space agencies with advanced notice of an Earth-directed CME. So what if a CME reaches Earth? For a start, much depends on the magnetic configuration of the IMF (from the Sun) and the geomagnetic field of the Earth (the magnetosphere). Generally speaking, if both magnetic fields are aligned with polarities pointing in the same direction, it is highly probable that the CME will be repelled by the magnetosphere. In this case, the CME will slide past the Earth, causing some pressure and distortion on the magnetosphere, but otherwise passing without a problem. However, if the magnetic field lines are in an anti-parallel configuration (i.e. magnetic polarities in opposite directions), magnetic reconnection may occur at the leading edge of the magnetosphere. In this event, the IMF and magnetosphere will merge, connecting the Earth’s magnetic field with the Sun’s. This sets the scene for one of the most awe inspiring events in nature: the aurora. As the CME magnetic field connects with the Earth’s, high energy particles are injected into the magnetosphere. Due to solar wind pressure, the Sun’s magnetic field lines will fold around the Earth, sweeping behind our planet. The particles injected in the “dayside” will be funnelled into the polar regions of the Earth where they interact with our atmosphere, generating light as aurorae. As if the radiation from the Van Allen belt wasn’t enough, satellites could succumb to the threat of an expanding atmosphere. As you’d expect, as if the Sun hits the Earth with X-rays and CMEs, there will be inevitable heating and global expansion of the atmosphere, possibly encroaching into satellite orbital altitudes. If left unchecked, an aerobraking effect on satellites could cause them to slow and drop in altitude. Aerobraking has been used extensively as a space flight tool to slow spacecraft down when being inserted into orbit around another planet, but this will have an adverse effect on satellites orbiting Earth as any slowing of velocity could cause it to re-enter the atmosphere. Although satellites are on the front line, if there is a powerful surge in energetic particles entering the atmosphere, we may feel the adverse effects down here on Earth too. Due to the X-ray generation of electrons in the ionosphere, some forms of communication may become patchy (or be removed all together), but this isn’t all that can happen. Particularly in high-latitude regions, a vast electric current, known as an “electrojet”, may form through the ionosphere by these incoming particles. With an electric current comes a magnetic field. Depending on the intensity of the solar storm, currents may be induced down here on the ground, possibly overloading national power grids. On March 13th 1989, six million people lost power in the Quebec region of Canada after a huge increase in solar activity caused a surge from ground-induced currents. Quebec was paralysed for nine hours whilst engineers worked on a solution to the problem. The short answer to this is “no”. The longer answer is a little more involved. 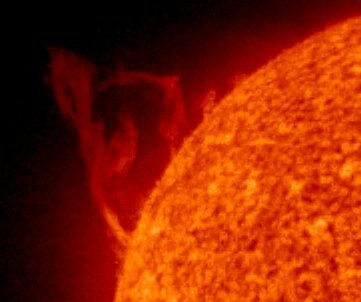 Whilst a solar flare from out Sun, aimed directly at us, could cause secondary problems such as satellite damage and injury to unprotected astronauts and blackouts, the flare itself is not powerful enough to destroy Earth, certainly not in 2012. I dare say, in the far future when the Sun begins to run out of fuel and swell into a red giant, it might be a bad era for life on Earth, but we have a few billion years to wait for that to happen. There could even be the possibility of several X-class flares being launched and by pure bad luck we may get hit by a series of CMEs and X-ray bursts, but none will be powerful to overcome our magnetosphere, ionosphere and thick atmosphere below. “Killer” solar flares have been observed on other stars. In 2006, NASA’s Swift observatory saw the largest stellar flare ever observed 135 light-years away. Estimated to have unleashed an energy of 50 million trillion atomic bombs, the II Pegasi flare will have wiped out most life on Earth if our Sun fired X-rays from a flare of that energy at us. However, our Sun is not II Pegasi. II Pegasi is a violent red giant star with a binary partner in a very close orbit. It is believed the gravitational interaction with its binary partner and the fact II Pegasi is a red giant is the root cause behind this energetic flare event. 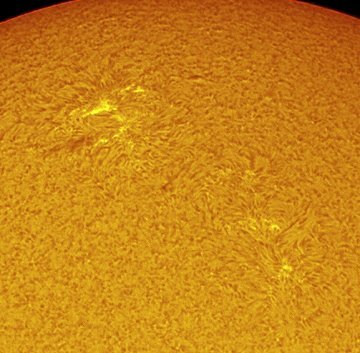 In an added twist, solar physicists are surprised by the lack of solar activity at the start of this 24th solar cycle, leading to some scientists to speculate we might be on the verge of another Maunder minimum and “Little Ice Age”. This is in stark contrast to NASA solar physicist’s 2006 prediction that this cycle will be a “doozy”. Last edited by Redsunset; 23-04-2009 at 15:54. The Little Ice Age is a period between about 1300 and 1870 during which Europe and North America were subjected to much colder winters than during the 20th century. The period and can be divided in two phases, the first beginning around 1300 and continuing until the late 1400s. There was a slightly warmer period in the 1500s, after which the climate deteriorated substantially. The period between 1600 and 1800 marks the height of the Little Ice Age. The period was characterized by the expansion of European trade and the formation of European sea born Empires. This was directly linked to advances in technology harnessing more of nature's power and towards the end of the period fossil-fuelled power. These two hundred years also saw the specialization of agricultural regions, which produced specific products for local and international markets. The cause of the Little Ice Age is unknown, but many people have pointed at the coincidence in low sunspot activity and the timing of the Little Ice. This so called Maunder Minimum1 coincided with the coldest part of the Little Ice Age, in particular during the period roughly from 1645 to 1715, when sunspots were a rare occurrence, as noted by solar observers such as Galileo. A minimum in sunspots, indicates an inactive and possibly colder sun and qonsequently less energy output to warm the earth. The north Atlantic is one of the most climatically unstable regions in the world. This is caused by a complex interaction between the atmosphere and the ocean. The main feature of this is the North Atlantic Oscillation (NOA), a seesaw of atmospheric pressure between a persistent high over the Azores and an equally persistent low over Iceland. This is the "normal" pattern, but sometimes the pressure cells are trading places and that has severe consequences for the weather in Europe. When the situation reverses, called a Negative NOA (high over Iceland and Low over Azores) the westerlies weaken or even reverse and cold air is streaming over Europe, causing a cold winter here. In negative NAO winters, it is much less stormy over the North Atlantic. Any storms, which do occur, bring warm wet air from the ocean into the Mediterranean region. The small pressure difference allows northerly air to blow into Northern Europe making the winters dry and sunny but very cold here. There are strong indications that during the Little Ice Age the NOA was more often in a negative mode. Scandinavia was also hard hit by the colder conditions of the Little Ice Age. Tax records show many farms were destroyed by advancing ice and by melt water streams. Travellers in Scotland reported permanent snow cover over the Cairgorms in Scotland at an altitude of about 1200 metres. In the Alps, the glaciers advanced and bulldozed over towns. Ice-dammed lakes burst periodically, destroying hundreds of buildings and killing many people. As late as 1930 the French Government commissioned a report to investigate the threat of the glaciers. They could not have foreseen that human induced global warming was to deal more effective with this problem than any committee ever could. During the later Middle Ages., slowly but steadily farmers started to experiment with new agricultural methods, in order to adapt to increasingly unpredictable climates and also stimulated by the growth of profitable markets in growing cities and long distance trade. Between 1600 and 1800, large areas of the Netherlands, England and some other countries around the North Sea were reclaimed. Notable examples are the draining of lakes in Holland and the reclamations in East Anglia. The Dutch possessed sufficient technological expertise and a sufficient degree of organization to diffuse the worst effects of short term climatic variations. The Little Ice Age might have imposed more benefits than costs on Dutch society. Extensive land reclamation and the use of new mechanical technology, as well as the intensive exploitation of natural resources (peat) turned liabilities into assets so powerful that they helped to forge the first modern economy in Europe. Soon the new agriculture and reclamation technologies as well as other mechanical techniques were introduced in Britain where it was all taken a step further in terms of scale and later the improvement movement would make agriculture more scientific. In addition the mechanical technology would be used to develop mechanical machines driven by steam and a new fuel: coal. It was the start of the Industrial Revolution and the transition from natural power, mainly derived from wind and water, to fossil fuel based industries. Unlocking the power of fossil fuel would transform the relationship between human culture and the natural environment in ways the world had never seen before. 1. The Maunder Minimum is named after astronomer E.W. Maunder who discovered the absence of sunspots during that period. Recently published data suggests that the Sun expanded during the Maunder Minimum and its rotation slowed. A larger and slower Sun, it is speculated, might also mean a cooler Sun that provides less heat to Earth. (Just why the Sun expands and contracts is not entirely understood. Last edited by Redsunset; 23-04-2009 at 15:23. And so begins the start of another spotless stretch. I'm not too sure how much science there is behind the 2012 massive solar flare predictions, possibly some are being swayed by the Mayan calendar business, which seems like one of those Nostradamus-style predictions to me. The Mayan calendar has been running through cycles of 260 years much as our calendar runs through 100 year cycles, and while they have a legend of big things happening at the end of each grand cycle, evidently this is not always the case. And one is reminded of the fizzle-out of the Y2K non-event. Having said that, I do subscribe to the view that sooner or later (whether in 2012 or later) the odds favour another giant solar storm that will certainly throw the earth's electrical grids into chaos. The largest event of recent years, in March 1989, had that effect on the Quebec (eastern Canada) grid, and I remember the bright auroral display at that time, living fairly close by in Ontario. However, our power didn't go out for more than a few minutes. In Quebec it was more like one or two days. You would think that the world would have 24-48 hours warning of such an event as the 1859 flares, and it might be possible to stage a planned outage of most electricity before the magnetic storm hit the earth, then bring back the power in a controlled manner after the storm faded out. This would require more international co-operation than we presently might expect, but it could be done region by region, the world's electrical grids are basically continental in scale, or regions within continents. If North America managed its grid successfully and Asia did not, the aftermath would be different in each case, although there would be some effects either way. You also have to wonder how safe our electrical grids are from terrorist or hostile nation attack, there are many stories circulating about (for example) China's ability to program into computer networks and read what's going on from an unknown safe vantage point (in cyber-space terms) then have the ability to throw a big old monkey wrench into what seems like a secure system at some unknown future time (for some unforeseen reason too). Have a nice day, as they say. This image was taken at 11:36am this morning.just amazing.we take it so much for granted,along with lots of other stuff. However our not so little beauty burst into life yesterday. The complex explosion produced not one but two billion-ton coronal mass ejections (CMEs): movie. An impact from such a double-CME would almost surely spark magnetic storms around the poles of Earth, but it is not heading in our direction. The chance of auroras remains low. SUNSPOT 1016: A ring-shaped sunspot numbered 1016 has emerged near the sun's equator. Its magnetic polarity identifies it as a member of old Solar Cycle 23. Until these old cycle sunspots go away,the solar minimum shall remain. Last edited by Redsunset; 12-05-2009 at 23:35.
great thread youve got going here.Wish I had read it sooner.Im hoping for a nice frosty minimum too.It would be a nice change from these record breaking summers. Lol gotta love the 2012 hype.Great video .Someone should tell him that most mountain ranges sit on top of fault lines. With you 100% on the moonLanding.How stupid do they think we are?They were going to the moon every weekend,mucking about playing golf 35 yrs ago,and now they need 20 yrs and $20 billion just to go once.What,was it some futuristic alien technology that theyve now lost .Maybe its like the movie Idiocracy.